There is a 65 to 75 percent chance of La Nina conditions continuing through the winter according to the Climate Prediction Center, up from 55 to 65 percent in late October when the National Oceanic and Atmospheric Administration released its winter outlook. There is a greater than 50 percent chance of the conditions continuing though the February to April time frame. La Nina conditions were also present for the winter of 2016-2017 before returning to average conditions for the summer. For the United States, La Nina's impacts tend to include above-average precipitation and colder than average temperatures for the northern part of the nation while the southern portions can expect to experience warmer and drier than average conditions. In Colorado, the outlook in October called for a warmer than average winter across most of the state, though it was less certain for the northeast portion. Average amounts of precipitation are expected, however northwest Colorado has a chance of seeing a wetter winter. When data from La Nina winters from a nearly 70-year period is averaged, northern and western Colorado are slightly cooler than average, while the southeast quarter of the state tends to be slightly warmer. For precipitation over the same period, western Colorado tends to be minimally wetter while the mountains and eastern half of the state are near normal. The ten most recent La Nina winters, however, show the state as a whole being slightly warmer than average. While La Nina conditions can indicate climate variations from seasonal norms, weather conditions will still be highly variable at any particular location, and cannot be predicted with accuracy beyond a few days or a week. For example, snow forecasts typically cannot be predicted more than a week in advance since they depend upon the strength and track of specific winter storms. La Nina is a cooling of the Pacific Ocean surface to below-average temperatures while easterly winds along the equator strengthen. 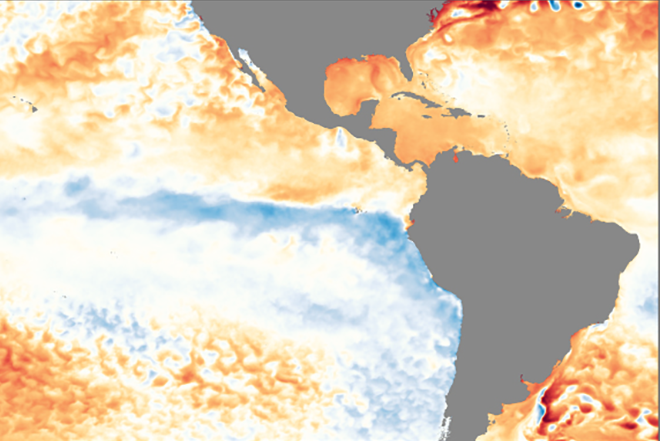 By contrast, El Nino is a warming of the ocean's surface to above-average temperatures and low-level surface winds decrease - and, in some cases, reverse to a westerly flow. Together with neutral conditions, where surface temperatures and winds are close to average, La Nina and El Nino are part of the El Nino-Southern Oscillation (ENSO) that impacts temperatures and precipitation on a global scale as it changes atmospheric circulation. Weather updates throughout the day can be found at www.KiowaCountyPress.net.